Hope you’re well, and are having a great week! It’s Friday… the weekend’s almost here… and the sun’s out here in the UK! Anyway, it’s that time of week again for our Top 5, where we show you some of our favourite Native Ads from the past 7 days! If you’re not yet a NativeAdBuzz member, you can take advantage of a $7 trial by clicking here. BUT YES! THAT’S RIGHT – You can find out what your name really says about you if you click here!!!!! LOL – jokes aside, this is a long-performer in the Native Ad world, and we suspect the bizarre imagery has something to do with the success levels of the Ad! It’s enjoying consistently high levels of traffic, and as you can see, it’s a very strong Ad – so take note! I used to keep a scrapbook. If like me you ARE the creative type, this ad’s perfect for you. A nice, calm, inspiring image, featuring a direct, and ‘to-the-point’ headline ensures that this ad is resonating with the target demographic very well. It’s also another long-term high performer, with large traffic volume and great strength within the Native Ad industry. So, who’s the snorer in the picture? Also; any ideas what the cool ‘trick’ is? Maybe it’s something to do with creepy photographers snapping two sleeping people on a plane… who knows! What is for sure, is that this Ad is AGAIN, another long-performer in the Native Ad industry, and having run for almost a year, it’s an Ad that – while it leaves a bunch of questions unanswered – makes us very curious to know more! Is Your Acid Reflux Killing You? Then s&!t yes! SIGN ME UP! How does the image relate to killing me? Breathing fire is still pretty cool, no matter what way you look at it! And it just goes to show… maybe more people than you THINK aspire to be a Dragon! Didn’t I see this image used in a recent Trump campaign? This must be a figment of my imagination! You should see my family…nothing like this! Anyways, interestingly, this image is actually pretty bland. But it does say teach your kid to read today, and any parent would attest to the attraction of this. Most of the parents I know are always stressed about their kids education. So remember – your next campaign should include a mum, dad, and a kid – it’s fool proof! And on that note, we arrive to the end of our Top 5 for this week. I hope you’re gonna have a great weekend – take some time off, enjoy the sun (if you have any! ), and get ready to come back to work next week fresh, rejuvenated, and ready to SMASH your Native Ad campaigns! 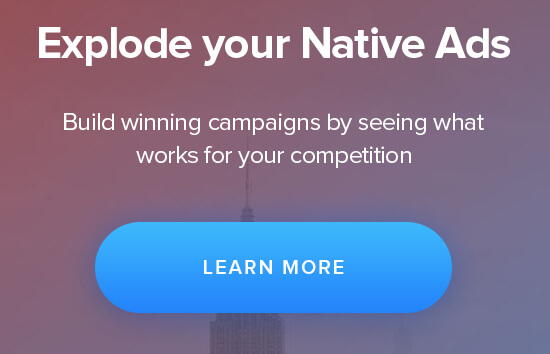 And… remember; all the ads from today were found inside NativeAdBuzz, and if you’re not already a member, you should claim your $7 trial by clicking here while it’s still available.